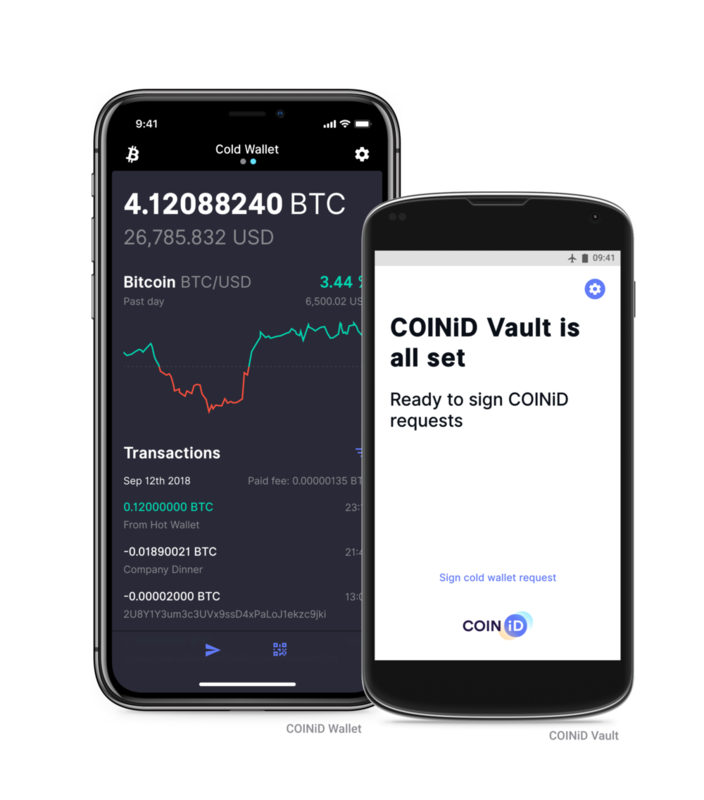 COINiD is a bundle of apps; the COINiD Wallet and the COINiD Vault. As of today, we offer wallets for Bitcoin, Myriad and Groestlcoin, and we hope to increase that number over time. For many mobile wallets, there is one application you need to download, so why do we have two? What is the purpose of the COINiD Vault, and how does it work together with the wallet? If you have read our previous articles on hot and cold storage, you might have learnt when the different apps are used and when they integrate. Nevertheless, following is a more specific description of the purpose of the two applications. The wallet is installed on your everyday smartphone and is, as a wallet generally is supposed to, used to store your coins and to send and receive funds. It keeps track of the user’s transaction history and balance and allows the user to create unsigned transactions that are to be signed with the COINiD Vault. For the transactions, you can choose to batch several transactions before signing in order to save space on the blockchain and to lower transaction fees. For convenience, the wallet is also designed to show you price graphs and currency conversion directly in the app to help you predict the best times for trading and how much your funds are worth. Additionally, for your protection, we designed the wallet so that it hides your balance in idle mode and when opening receive dialogue. As you can see, the wallet serves the purpose that one as a user may expect that a wallet will, but with additional touches to enhance your experience. This is also where the COINiD Vault comes in. One can say that while the wallet acts like the creative, ambitious person in the office who comes up with all ideas and wants to put them all to action, the vault acts like the mature, experienced person who considers the ideas carefully before approving them. Just an extra simple step for security and consideration of your funds. Use your wallet to make unsigned transactions, see your balance and receive funds. The COINiD Vault complements the wallet in a sense that it is used to sign the transactions from the wallet app. It is very important for us that the users are in full control of their private keys, and therefore we have developed the app so that the private keys are stored in the local keychain or equivalent and never leave your device. Transactions can also be made by using FaceID or TouchID, which gives even higher protection of your private keys. On the security aspect, the vault also lets you validate the generated addresses to be sure that your account has not been compromised. Compare the address in your wallet to the one presented in the vault and make sure that they are the same. Simple but valuable. Nevertheless, the COINiD Vault can be used for more than signing transactions. It can also be used to create a cold wallet to securely store your funds offline. If you have a spare mobile device at home that you can keep completely offline, all you need is to install the COINiD Vault on that device, connect it to the wallet and you have yourself a cold storage. This was one of our dearest ideas about the application, that everyone should store funds offline without having to pay for specialized hardware. If you store COINiD Vault on a separate, offline mobile device, then you have the same principle as any other hardware for cold storage. Install the COINiD Vault on a separate offline mobile device to create yourself a cold storage for your coins. Installed on an everyday smartphone. Lets you create unsigned transactions to multiple recipients. Uses only publicly available blockchain data. Price graphs and currency conversion directly in the app. Used to sign transactions created in the wallet. Private keys never leave your device. Can either be installed on your everyday smartphone or offline on a spare device to create a cold wallet. Two apps with different qualities but that complement each other to make a wallet that gives you the best experience possible. Because we believe that two are better than one.